What are the first things that your mind conjures up when the city of New York is mentioned? The Big Apple? Extraordinarily colossal slices of pizza? The New York Yankees? However, I am reasonably sure that if I asked 1,000 people to name something that New York is synonymous with, I’d not hear the phrase ‘botanical gardens’ uttered once. Yes, that’s right, New York is world famous (within horticulturist circles) for its vast array of exquisite botanical gardens. And, since I often spend several hours each week in these beautiful sanctuaries of nature, I thought I’d introduce you to a few. Whether you’re here for a few days or here to stay, you simply cannot miss any of these! Being 150 acres in size, Highland Botanical Park is a vast expanse of color, every shade of green you can imagine and some genuinely amazing species of plants. The Lamberton conservatory houses a delightful selection of flowers, and if I’m in need of invigoration, it’s my go-to place. Even a mere ten minutes in there is enough to calm and soothe my mind. If I had to choose my favorite botanical garden, then Highland would get my vote. Got a full day to spare and want to spend it in nature? Clark Pontiac Garden is the place. Not only are there over 5,000 species of flowers to admire, but there is also a museum and an educational facility, meaning this is the perfect location to bring young children to learn about flowers, plants, insects and nature. Clark is celebrating its fiftieth birthday this year, so here’s to another fifty! If, like me, you’re a big fan of picnics, you must visit Planting fields! Only last week did me, and few friends pack up a hamper, grab a bottle of prosecco and spend the day enjoying good food, bubbly drinks and the breath-taking surroundings Planting Fields offers (is there any better way to spend a day?). But it’s not only a prime picnic spot; it’s perfect for walks, adventures and even weddings! 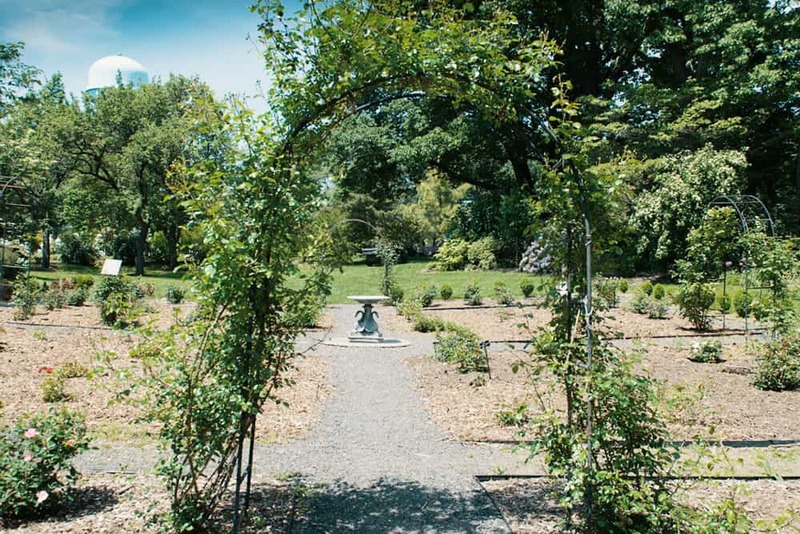 “Where people, plants and cultures meet” is the way Queens Botanical Gardens described itself – a truly marvelous triumvirate. What I adore about Queens is the variety of gardens. When walking from one to the next, it can often feel like you’ve made your way into a new country or even world, which not stimulates the senses but also prolongs the adventure. In addition to pure, natural beauty, Queens offers educational programs, a handful of which my children have absolutely adored. Picturesque views and tranquil gardens just a stone’s throw away from the Yankee Stadium’ is how I’d describe the Wave Hill. If you’re in need of serenity, then I cannot recommend this garden highly enough. Sumptuous flowers, the calming sounds (and views) of the Hudson River and magnificent scenery make this is an idyllic haven of restfulness. However, it does have another string to its bow. As some of the aforementioned gardens, Wave Hill also offers educational classes that help young ones understand and learn about nature.